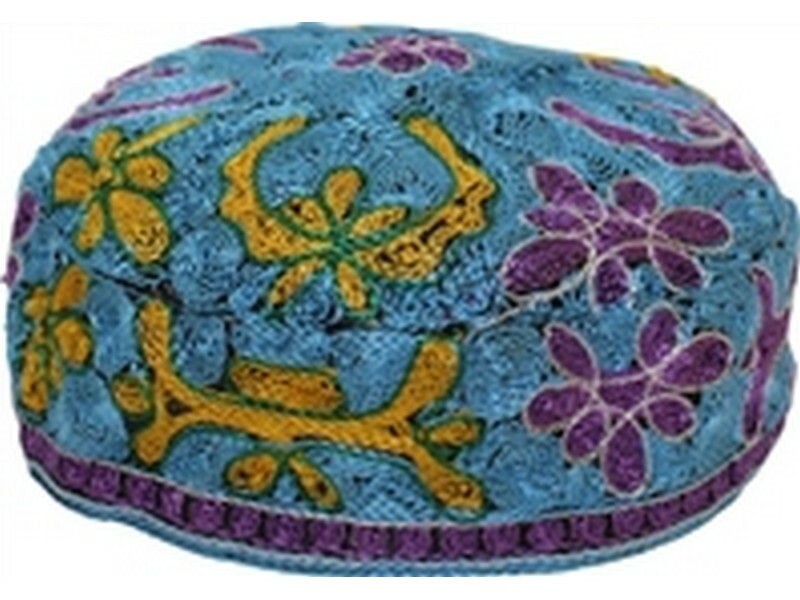 This aqua colored traditional styled kippah is proudly worn by Jews of Bukharian descend. The flat top style and the thick matching band around, holds the kippah firmly on the head. The Kippah is decorated with colorful traditional Bukharian designs. The Bukharian kippah is available in 5 sizes. The sizes note the circumference size if the kippah. The Jews Bukharia, located in central Asia, nowadays part of Uzbekistan, can date back their heritage from the times after the destruction of the Second Temple. While the land was conquered and changed hands countless of times over history, the Jewish population remained faithful to their religion and customs. The central city was Samarkand, was a central hub for Jewish merchants during the Silk Road era.